Look who’s fancy in 2014! (We are). I can’t really believe that another year is wrapping up — it never comes easy, this warp-speed time phenomenon. Weren’t we just watching my sister get married? Just brainstorming ideas for Mother’s Day brunch? Just putting strawberries on sandwiches? A lot of important things happened to me in 2013. I bought a doughnut pan (important). I had a niece named Matilda! I tried surfing (and wasn’t immediately attacked by a shark, which I was pretty sure would happen). I discovered yogurt mousse (yum). I started getting paid to write! Not much, mind you, but it’s something and it feels big. It’s been an important year, I think. So. Let’s send 2013 out with a bang. With bubbly toasts and other toasts which are golden-edged and topped with avocado and crab. 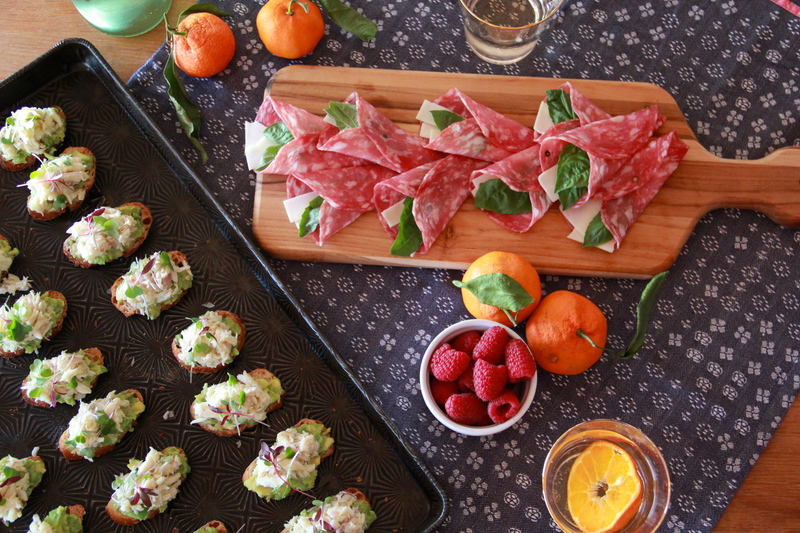 And charcuterie, too! Shaped like a cone because that sounds like fun. In truth, New Years Eve usually feels like an over-hyped affair to me. There’s a lot of pressure to do something amazing, to have the best (!) night (!) ever (! ), usually while out at a bar surrounded by strangers, which I feel like is a tall order. 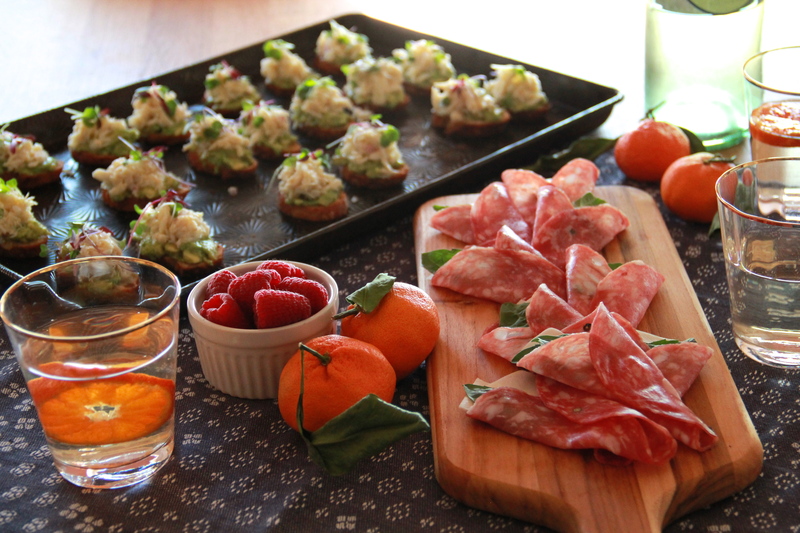 Let’s ditch the strangers (but keep the booze), and instead surround ourselves with loved ones and appetizers. Doesn’t that sound better? Crab toasts, meat cones, fancy outfits, bubbly flutes, and maybe even an overly decadent dessert or two. Our kind of party, I think. Happy New Year, all! I wish I could give you a hug. Be safe and content. Love to you in 2014! Heat the oven to 350 degrees F. Arrange the baguette slices, cut-side up, on a sheet pan. Toast the baguette in the oven until crisp and golden, flipping the pieces halfway through cooking, about 10-15 minutes. Set aside to cool. In a small bowl, mash the avocado with the juice of 1 lime, a pinch of salt and the red pepper flakes. Taste and adjust seasoning to your liking. Set aside. In a medium bowl, gently mix the crab meat with the shallot, the juice of the remaining lime, olive oil, and a pinch of salt, to taste. Spread some of the avocado on each piece of toast, and top with a spoonful (about a tablespoon per toast) of crab salad. 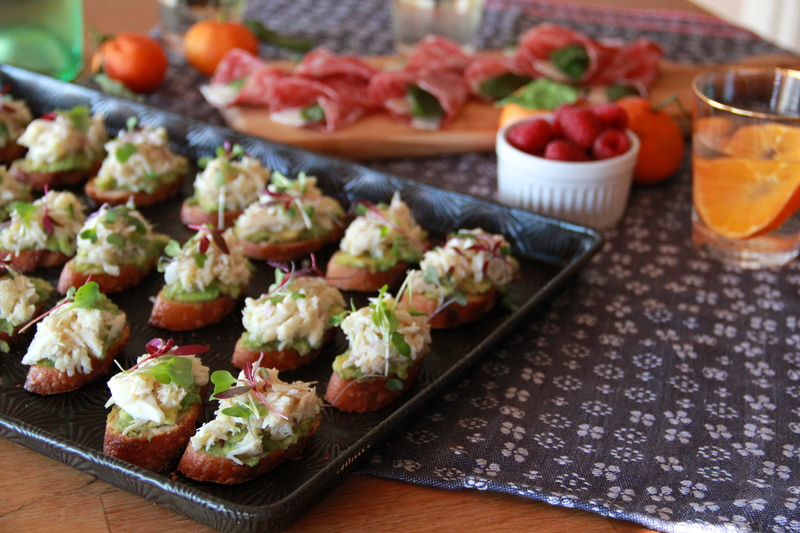 Drop some microgreens over the crab, and drizzle the toasts with an extra bit of olive oil. Serve immediately. Makes about 28 pieces. Lay a slice of sopressata flat on a work surface. Place a slice or two of asiago in the center of the meat slice, and lay a basil leaf on top. Fold the sides of the meat towards the center, overlapping to form a triangular shape. Place on a serving platter, and either serve immediately or refrigerate for a few hours until you’re ready to eat. Makes 10 cones (but can easily be doubled, tripled, quadrupled… meeeeat). Previous Post: « Cookie Swap! Yum. I wish I could give YOU a hug! Happy New Year Dunk and Crumble!